In 2011 Jocelyn and I rode the Southern Tier of the U.S. from Cape Canaveral, Florida to San Diego, California and I returned home right before Christmas after cleaning and selling my parents’ home in California. 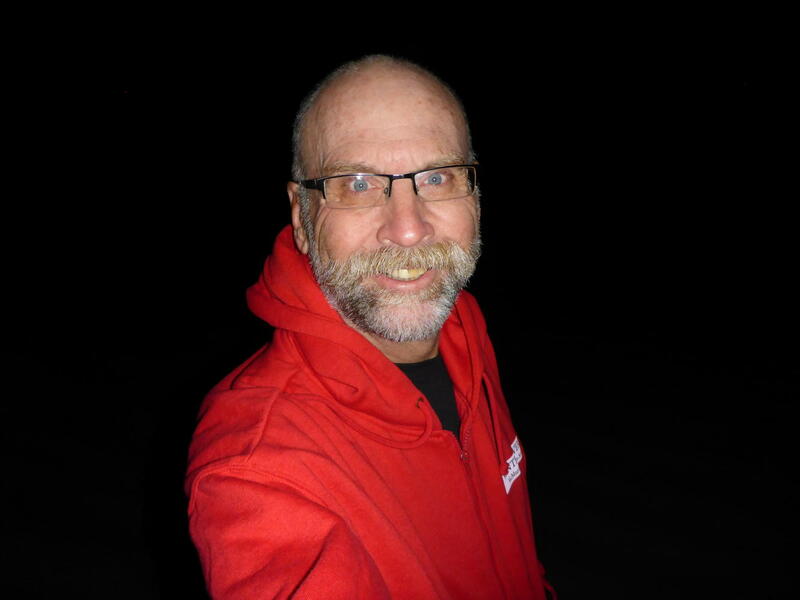 During the following Antarctic winter of 2012 (February to October) I worked my first Antarctic winter at McMurdo Station. Since the United States Antarctic Program (USAP) uses Christchurch, New Zealand as a base to travel to McMurdo and the South Pole and New Zealand is one of the top bicycling destinations in the world it seemed logical that Jocelyn and I cycle New Zealand when I returned from the ice. At that point we had two solid bicycle tours complete and had fleeting thoughts of discovering more of the world by bicycle. We never would have imagined our next route. Once again I worked the Antarctic winter of 2013 this time at Amundsen-Scott South Pole Station. During that time Jocelyn was on her own bicycle tours with two solo trips and the TransAmerica Trail from Virginia to Washington State with a friend. As I followed them cross country I was conjuring up a grand world trip. Since we had already crossed the U.S. and spent 6 weeks cycling New Zealand it seemed cycling across Europe would be a good next step. At this point it also seemed logical to continue across Asia which starts in Istanbul. My wife Andee agreed that this would be a good adventure and that she and my son Cary could join us somewhere along the way. After discussions with Jocelyn we set a route from Lisbon, Portugal following the traditional European cycling route to Istanbul then through Central Asia, China, Southeast Asia, ending in Singapore then fly to Australia. Along with leaving my Andee for a year, one of my biggest concerns was taking Jocelyn away from her growing life at 23 years old. She had left college after two years and was unsure of her future. But since she wanted to lead bicycle tours she readily agreed to travel with me as our leader. After researching February weather in Portugal and Spain I was concerned about starting that early then Jocelyn mentioned possibly starting in Morocco across to southern Spain up the Mediterranean Coast through Europe. Marrakech, Morocco seemed like a great starting point plus I would get Africa under my belt for my 7th and final continent! Shopping and packing was more intense than our first two tours as we were unsure of what would be available in Europe and Asia. As it turned out we once again over shopped and packed as most of what we need was readily available during most of our trip. This lesson learned will not be repeated for our Alaska to Argentina trip this May. During the isolated parts we also learned to adapt well with the minimum of everything. February 11th came quickly and we were on our way. It was sad once again to leave Andee and start on my own adventure, alone once again. What a lucky guy I am to have such a supportive and understanding wife. In addition to her job as a school teacher she had another tedious job as our financial accountant having to keep track of our expenses, paying the bills, and dealing with credit card fraud that occurred three times. This job had her staying up late into the night and dealing with our financial messes and mistakes. Through emails and Skype we coordinated the finances but it still required many trips to the bank to deal with the credit card fraud. Life on the road is a lot easier when there is someone at home tracking and supporting your trip. Many times I thought we had the easier part as all that we had to do is sit on our saddles each day and keep the wheels going round and round. Cary was also a huge help as he continued to live in our home. Along with working problems around the house, he was also very supportive of his mother who had to deal with us being gone. I won’t say it was easy for them, as it wasn’t, and all four of us suffered from some form of depression off and on during this trip. It was very difficult for all of us to start a trip of this magnitude and it is also very difficult to return. Why we are riding around the world – We were asked this question many times on the road and still are. People are surprised when we say that we are not riding for a charity. We have no sponsors and solicit no publicity. Once again people are surprised that we haven’t any news coverage. We are riding for ourselves. I did attempt to write a magazine article and submitted that but it wasn’t picked up. 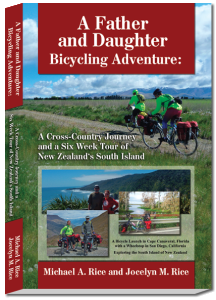 Much easier to write a book and have it published as we did after our U.S. and New Zealand tours. Since we self-publish no one will turn us down! Finances – Another frequently asked question is how this trip is funded. The initial outlay for my new bike, gear, and airline tickets to Morocco came from savings. Plus my wife is still working as a school teacher. The plan was to draw from my pension for our monthly expenses. After about 5 months through Europe we were finally in budget. Europe is very expensive especially hotels and really good eating. Bicycles – I had purchased a new Bruce Gordon Rock ‘n Road Touring frame outfitted with Shimano Deore XT parts and a trekking (butterfly) handlebar. Jocelyn started the tour with her stock Surly Long Haul Trucker (LHT) which was equipped with lesser quality Shimano and the standard drop handlebar. Both of our gear sets are 9 speed 44/32/22 with a rear 34 that gave us a very comfortable 16.8 gear inches for our climbing gear. In Turkey we discovered her frame was cracked along the chain stays where her kickstand was fitted. Later we found out that Surly recommends not using this heavy duty two leg kickstand on this bike. I used the same kickstand but my frame was not cracked. Her frame was replaced with the Santos Travelmaster 2.6 Aluminum using all her other parts. Both our kickstands were replaced with heavy duty touring single leg ones. Touring cyclists have a love and hate relationship with kickstands. We both love having one but do not rely on it during windy conditions. I researched rims before the trip and unfortunately selected the Mavic XM719 model. We started the trip with 4 new ones along with Shimano hubs and of course Schwalbe Marathon tires 26” x 2” (very stable). In fact 99.9% of other cyclists we met used these same tires. There must be a reason for this! As it was I had 5 punctures and Jocelyn 4. Seven of these punctures came from a small piece of shredded car steel belted radial tires. These tiny wires will puncture any tire in between the treading. They are also hard to find in the tire once the tube is removed. The first indication that the Mavic XM719 rims were not suitable for our heavy loaded touring was hitting a rut on a hard and fast downhill in Montenegro. It was all I could do to control the bike during an instant flat while still moving fast. Very scary too! I removed the tube which was slashed and looked at the inside rim to discover a spoke puncture. I was alarmed to see more than a dozen cracks emanating from the spoke holes. Some of these cracks were more than an inch long and can be contributed to stress and the load we were carrying. The next day we got a ride to one of only two bike shops in Montenegro to have that rim replaced. One week later Jocelyn’s rear wheel rim failed the same way. At this point we once again researched these rims and others with the help of an expert bicycle knowledgeable friend Joseph from El Paso, Texas. He enlisted the help of others and we found out through various sources that these rims are good for light duty only. How I missed that I have no idea. To make a long story short we were directed to the bicycling touring shop Bisiklet Gezgina in Istanbul, Turkey (http://www.bisikletgezgini.com/) which specializes in touring bicycles with excellent selection of parts and services. It is a great place to have your bike repaired/refitted and is situated between Europe and Asia. They recommended the European 36 spoke rims Xterra. We ordered 4 and when we arrived at the shop we discovered that our front rims were also cracking. The Xterra rims performed great for the rest of the trip. Our last rear puncture was in south China and I carefully inspected the rim. There were no cracks. East of Istanbul through Asia is when the hard and lots of off road cycling begins so we were very happy that we changed out all four rims. It was expensive but well worth it as we were never stranded in Asia due to a bicycle failure. When the rims were changed we also had SON28 dynamo hubs installed. These worked very well during the times we rode in the dark until mine failed in Tajikistan. Bisiklet Gezgina has mailed me a replacement. Jocelyn had continuous problems with her rear brake alignment as it always seemed one of the pads dragged against the rim. She started the trip with the standard cantilever brakes which were replaced with V brakes while in Serbia. As the pad alignment problems continued we stopped in many shops for adjustments and rear wheel truing but nothing seemed to work so she ended the trip with her rear brakes disconnected. She also had two rear derailleurs break which can be contributed to her heavy push uphill. Both of our bottom brackets were also replaced. Towards the end of the trip mine started making noise again so it might have loosened. Spares – We carried two spare Schwalbe folding tires and ended up using one. Along with that we had 4 extra tubes. We also had two spare chains and used them both and purchased another. Along with an assortment of small parts, tape, zip ties, we carried one each brake and derailleur cables for both our bikes. Inside Jocelyn’s seat tube were 5 front and 5 rear spokes. A few weeks ago I posted a magazine article I wrote while waiting in Kyrgyzstan for our China visas. I have copied that (with some editing) for the country summaries and have added the rest since Kyrgyzstan. Morocco – This was Jocelyn’s idea as we were going to start from Lisbon, Portugal and head north around Spain. February is not a good cycling weather month in northern Spain plus by starting in Marrakesh, Morocco I achieved my seventh continent, Africa. Morocco is mysterious, fascinating and a lot of fun. I was a bit skeptical and worried about being dropped into a Muslim country with my daughter and our bikes but all that was needless worry. We had a great time exploring the ancient Kasbahs and many ruins that Morocco has to offer. We also explored the ancient medinas (old walled towns) in the cities of Marrakesh, Fes and Chefchaoven. These were wonderful places to wander in for hours and sample local foods and the many shops. The cycling through river gorges, into the Atlas Mountains and through the desert was excellent. We traveled to southeast Morocco and spent a few days camping in the Sahara Desert. We were able to cycle in many areas of Morocco due to our wonderful guide Abraham. 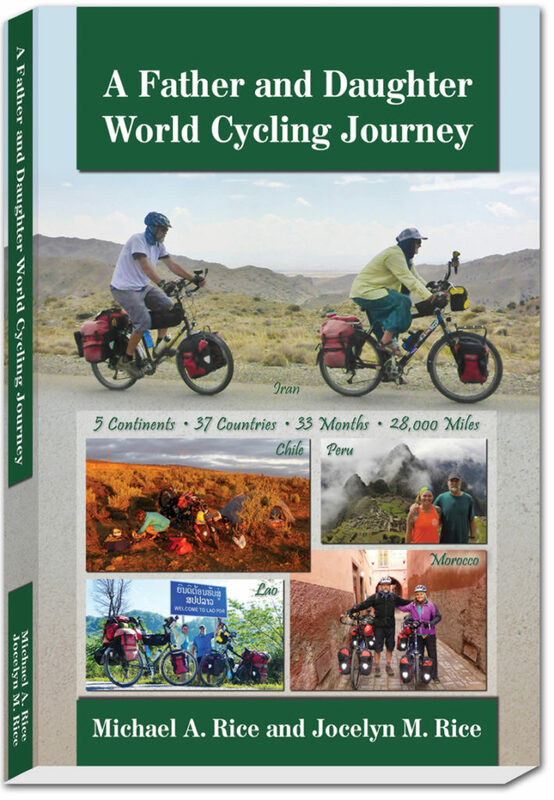 He has been guiding touring cyclists in Morocco for 16 years and knows all the great cycling routes. It was a smart way to start our tour. Spain – We crossed the Strait of Gibraltar from northern Africa to Algeciras, Spain and immediately continued building our cycling legs on Spain’s steep coastal roads. Occasionally we would head into the mountains for a change of pace. But the coast was fun so we spent more time exploring that since we are beach people. Often times we would ride along the coast into a town and have lunch at an outdoors seaside restaurant. This was our introduction into the delicious seafood soups that Spanish cuisine offers. And after those lunches we would continue cycling, sometimes only a few miles, into the next town and call it a day. The old castles and forts were striking and easy to explore from our bikes. We were way ahead of the tourist season so traffic was light except in the cities. The old cities of Cartagena, Valencia, and Barcelona were sometimes difficult to travel through but with the help of our warmshowers hosts were able explore with their directions. It was in Spain that we took our first train ride inland to bypass a very busy area between Cartagena and Valencia. We stayed in touch with a good friend of ours who suggested many different areas to ride and what to eat. France – We crossed into France over the southern edge of the Pyrenees Mountains. Once again our general route was up the beautiful coast while sometimes heading inland. The headwinds were quite a battle but the hills much more gentle than Spain. We were still ahead of the tourist season so traffic continued to be light. It was easy to order fish from the many seaside restaurants and the wine was superb. We did explore a few wineries and I always had room in one of my front panniers for a bottle that we would enjoy in a hotel room or camp site. From France we dropped down into the little municipality of Monaco. This is the richest country on earth for its size and we spent a fun afternoon walking the streets, ogling the yachts, and generally exploring the “lifestyles of the rich and famous”. Unfortunately the famous casino from James Bond, Monte Carlo, wouldn’t let us in due to their dress code. But we did hang out in front and people watch along with many other tourists. We had a wonderful host near Monaco for three nights. It was also fun cycling the French Riviera although we did look like the “Beverly Hillbillies”. Italy – It was an easy coastal ride from France into Italy. So far there has been no active border control at the crossings. The coast was very hilly especially after the first major city of Genoa. That city in itself was a real challenge to cycle through. If fact the traffic was so bad we pulled over to a hotel as there was no way we would make it out before dark. The next day we headed into the hills on a very steep cliff seaside ride with our reward being another great beach restaurant. We then headed into the mountains, passed a summit, and looked for water as we were empty. We thought of camping without water but cycled into a mountain village and spotted a restaurant where we took our bottles to refill. There was maybe a campground 10 miles down the road and it was getting dark. Jocelyn noticed a sign that this restaurant was also a small hotel so we took a room after a very exhausting day. It turned out to be a great place with an award winning restaurant and winery. After a quick jaunt to the coast and another warmshowers host we cycled to the famous cities of Pisa, Florence then north to Venice. All these cities were special in their own way and we spent a few extra days in the last two. Venice was fun but is definitely not for bikes as the streets (mostly alleys) are very narrow and full of pedestrian traffic plus all the islands are connected by small high arched bridges that are very difficult to carry bikes over. It is under these bridges that gondolas and supply boats pass. After a ferry ride off the island we continued and rode into the country of Slovenia. Slovenia – We only spent two days in this beautiful rolling mountain country. While looking for a camp site a young mother saw us and invited us to pitch our tent in her garden. We readily agreed and when her husband arrived home we had a grand meal. Jocelyn really enjoyed their small children. At this point we were convinced to travel south into the Balkan Peninsula which consists of the countries Croatia to Romania and through Greece instead of our planned route up into Austria then southeast through Hungary and Romania. Croatia – We spent nine days cycling through the interior and then the beautiful coastline in sight of thousands of islands. The scenery was great although the weather was fairly rainy and the drivers the worse yet. It was sometimes hard to negotiate with the drivers as they didn’t seem to care for cyclists. After passing through the interior we had Easter Sunday lunch on a tall bluff restaurant overlooking several large islands. The coast continued to amaze us with a Hollywood picturesque cove with small fishing boats seemingly around every corner. The miles came easy, we island-hopped via the great ferry service, and were soon in the historic old city of Dubrovnik where we spent a few days exploring. Bosnia – We climbed out of Croatia and entered Bosnia. We had a good lunch and enjoyed the countryside and people while climbing to Montenegro in the rain. Montenegro – We climbed several hours to achieve Montenegro. Soon over the top we found a place to camp as the closest town was still many miles away and it was dark. It seems as though except for a few small towns we were always in the beautiful mountains that still held snow from the previous season. It was here that our wheels (rims) started failing and we had to catch a ride back south to one of only two bike shops in the country. After repairs and much needed maintenance we continued back north into the mountains and encountered one of the first snows of the new season. It was very cold and windy but fortunately the snow didn’t stick. We passed through a very long and poorly lite tunnel that really scared us as trucks and busses sped by. Towards the border we passed through many other tunnels and beautiful mountain roads as Jocelyn played “The Sound of Music” from her bike speaker. It was truly wonderful as we passed into Serbia. Serbia – Serbia was five days of beautiful terrain, friendly people, and great hospitality and ranks among one of our favorite countries. This journey is all about the people we meet and we met many here that we can call friends. We spent one entire day riding along a swollen river that was just gushing with water. This river meandered back and forth through some very pretty countryside and ranks as one of our top rides. We ended our stay in Serbia with two days at a warmshowers host’s ranch. The last day was spent working with our host’s friends on a property to add a new fence. What a hoot as the drinking started way before the work. We were told that this was the “Serbian way”. It was once again fun times with friendly people. Bulgaria – This was our least favorite country as the people were unfriendly and some just plain rude. The towns were also somewhat trashy and the overgrowth of grass and bushes was apparent everywhere. We did travel across the Danube River to spend two nice days in Romania but then back to Bulgaria where we rode long hours to exit into Greece. Romania – Only two riding days in this beautiful friendly country. We loved riding alongside the standard local transportation of horse and cart. Everywhere people waved to us as we passed. In the many villages we the townspeople sat on benches and passed the time. This was truly the “old country”. Too soon we had to cross back into Bulgaria by ferry as we were meeting family in Istanbul, Turkey so were now on a schedule. We would have loved to cycle up to northern Romania and Transylvania but there just wasn’t time. We looked into the bus and train system but that would not have worked out. Greece – Another very friendly and scenic country. We were welcomed everywhere we went and spent three days cycling from northern Greece to the beautiful coast where we spent an extra day at a quaint seaside motel. Once again we were still ahead of the tourist season so the traffic was light. We then headed into the mountains and over to the major border city of Alexandropoulos where we prepared for our extended trip into Turkey. Turkey – What a wonderful country! I was thinking it would be more in line with Morocco but the infrastructure was very modern. Entering the border was a bit scary with all the military and five checkpoints but once inside it became very relaxed. Our goal was to be in Istanbul by the end of May as we were meeting family and my wife Andee had set up a “vacation” for everyone with flights to a southern resort area of Bodrum Bay. Since we had time we decided to ride south into Turkey, over the mountains, and to the major port city of Bandirma. From there we would take a ferry to Istanbul instead of cycling through Istanbul on a very busy highway from the west. Near Bandirma was a fine camping area on the Aegean Sea where we spent a few days before our ferry ride. Istanbul was a very crazy place to cycle. We had made arrangements for an apartment in the old city then rode and walked our bikes to a really nice bike shop on the Asian side for extensive maintenance including new rims. Istanbul is the end of Europe and a ferry east takes you to Asia. We then settled down in the old city as family including my wife, son, sister, cousin and his wife arrived. Several days were spent touring Istanbul’s historic sites. We then flew to Bodrum for a very restful seven days at a south Turkey resort on the Aegean Sea. All too soon that ended and it was back to Istanbul for more sightseeing before everyone flew home. We stayed around a few more days for visa work then ferried across the bay and into the central Turkey mountains for our long trip across the country. The mountain passes were steep and difficult but very rewarding. We spent another week in Ankara at a warmshowers host while we continued to work through our upcoming central Asia visa requirements which were very tedious at the best. Turkey continued to surprise us with very friendly hospitality and stunning mountain vistas as we rode north to Georgia. Turkey was the beginning of the Silk Road, an ancient caravan route to China. Georgia – We cycled north into Georgia and after a few days on the Black Sea coast headed into the central mountains. This is where we cycled over unpaved mountains in the heat and started drinking fountain water without filtering or sterilizing. We were both soon sick and after a few days continued east to Azerbaijan. Azerbaijan – While in Georgia we were messaged that our Iranian visas were ready. This was great news since we didn’t think the visas would be approved. While in Istanbul we started visa work for the central Asia countries around Iran not knowing that Iran was still in work. We made a beeline across Azerbaijan only to have the Iran visas held up in Erzurum, Turkey. We then spent almost a week in Baku, Azerbaijan visiting the Iran Consulate and working through many transfer problems. Since we traveled most of the country through the central highway we really didn’t give Azerbaijan a fair chance for exploring as we did hear that the northern mountains were very beautiful. Our ride east along the highway proved very hot and boring. In fact this ride was the most boring of the trip. Iran – Iran was a wonderful country and we are very happy to have pursued this visa even though many people thought us nuts. Before this trip we had said that we would not let the media dictate our route. The Iranians are very friendly and open and we were welcomed into so many homes for tea, dinner, and sleep. We wish that we could repay this hospitality in our home but it is extremely difficult for an Iranian to get U.S. visa. Everywhere we rode people would drive alongside us and hand us fruit and say “Welcome to Iran”. Markets would sometimes give us water and food then say “Discount” and we would pay nothing. Along with all this the cycling in the deserts and mountains, especially in the jungle, was beautiful. The mosques were absolutely beautiful with stunning tile work. Jocelyn always attracted a crowd and was a real trooper while having to be fully covered in sometimes over 120 F heat. Most women in Muslim countries don’t know how to ride a bike so she was a curiosity. When the townspeople found out we were Americans women ran up to Jocelyn wanting a picture with her and she readily obliged. But sometimes when we wanted to take the pictures they would shy away partly in the fear of the picture showing up on the internet. For this part of our world journey Iran was our first 1,000 mile country with Spain a close second at 823 miles. Tajikistan – Tajikistan was the first country we did not bicycle to because of our visa situation. We flew to the capital city of Dushanbe from Mashhad, Iran where we prepared for our Pamir Mountains adventure. The Pamir’s are one of the top cycling destinations in the world and the ride did not disappoint. The mountains and Wakhan Valley were simply stunning as the difficultly increased. Cycling and living at over 14,000 feet is very arduous especially if you are sick. Jocelyn had a really tough time as she has a recurring stomach problem which causes nausea, vomiting, and diarrhea. Combine this with altitude sickness and it can really slow you down. I spent the last winter of 10 months at the South Pole and have seen what altitude sickness can do. Fortunately I adapted much quicker. Camping at over 14,000 feet is another adventure when there is ice in the tent and all your water freezes. There are certain parts of the Pamir’s Wakhan Valley that I would never cycle in again maybe just because, and I hate to say this, “I’m too old for that”. But we are both very happy that we did it once. Kyrgyzstan – This is the second country where we did not cycle across the border as we were both ill and were driven to the city of Osh. Most of the country is mountainous and very beautiful. In fact our only cycling in Kyrgyzstan was around the city of Osh where we spent 3 weeks recovering from Jocelyn’s medical problems and waiting for our China visas. China – We spent 20 hours on a bus from Osh to Kashgar, China. We could have cycled to the Kyrgyzstan/China border but from there no bicycling is allowed until the first major China city of Kashgar. This 120 mile stretch can be crossed with a taxi but we would have required two taxis since they are small. We spent the next 1 ½ weeks train touring the Gobi Desert with stops in Urumqi, Lanzhou and Chengdu. From Chengdu we continued south on our bikes to Vietnam. Although we really enjoyed the Chinese food and southern mountains, China was one of our least favorite countries. We never did get used to the loud and pushy people and all the extremely noisy traffic. The Chinese drivers love to honk their car horns at everything and everyone no matter what the situation. We covered 2,200 miles on the train but with only a 30 day visa it could not be biked unless we applied for and waited several days for an extension. There is a bike China challenge to bicycle across the country in 60 days. We did meet a few who accomplished that very tough task. They both said that biking across the very windy Gobi desert was extremely difficult in that time frame. As it was we biked 662 miles in China and exited on our very last visa day. We cut that too close. Vietnam – Another great country where we traveled across the northern Vietnam mountains to Laos. The people were very friendly and the food tasty with much larger portions than China. It was also the beginning of Southeast Asia and very inexpensive living expenses. Laos – Central Asia was very high mountains to cycle and Laos started the ups and downs of mountains in the midrange of 3,500-4,500 feet. The cycling was very difficult at times on the broken up or non-paved roads. Our two day cruise up the Mekong River to Thailand was wonderful and once the again the living was very cheap. Laos was the start of beautiful Buddhist Temples. Thailand – Thailand was one of our favorite countries with beautiful temples seemingly around every corner and extremely friendly people. In fact along with the Iranians and Serbs the Thais share the award for the friendliest of people on our trip. The closer we traveled to Bangkok the prices increased. With warmshowers hosts we only had to spend one night in a hotel. That was a real treat as we were able to use that extra cash for touring Bangkok and exploring wonderful Thai food. Weather – Starting early in the year we had a few concerns with weather. But as it turned out Morocco was excellent except for snow at the top of the Atlas Mountains which was to be expected. Southern Spain was a delight unlike the northern part which was still rainy and cold. In Europe we faced mostly headwinds all the way. Once in Croatia the rain started and was pretty intense especially with the awful Croat drivers who are the worst drivers we encountered. The rest of the Balkans was sunny and mild along with Greece and Turkey. Summer was spent from Turkey, Georgia, and Azerbaijan to Iran and it was very hot especially in the deserts of Iran. Jocelyn suffered the most as she wore a hijab and was totally covered in temperatures up to 125 F (55 C). As we entered Tajikistan and the Pamir Mountains it was close to winter and we did have some snowy and cold days at altitude. Camping above 14,000 feet with ice inside the tent and frozen water bottles is a real adventure. Southern China was rainy and muddy but once in Southeast Asia we hit the tropics and it became more like Florida. The heat and humidity increased as we rode closer to Bangkok. There was no rain as the monsoon season was over. Currency – It was sometimes a challenge to switch currencies as we continued east. I always carried a little cheat sheet in my wallet to figure out the dollar amount. We tried to avoid currency exchanges at borders but sometimes it was unavoidable. We thought that banks would always have better rates but this is not true at all. In Iran the best exchange rates were in jewelry stores. Also in Iran ATMs or credit cards for Americans will not work so you must enter with lots of cash on hand. We flew from Mashhad, Iran to Tajikistan and that required about $700. We often compared rates among several sources when entering a new country. There were a few times when a person on the street had better rates. This really surprised us. Andee wired money through Western Union while we were in Azerbaijan. We always carried at least $2,000 in USD for emergencies on us and our bikes scattered in several areas. If you think about it there are many good areas to hide cash. Dogs – After Europe there were stays dogs everywhere, sometimes alone or in packs. If one started up they all would. We were chased many times but managed to stay ahead of them until close to the Iran border in Azerbaijan where one clamped onto my right ankle. Bleeding with four puncture wounds we entered Iran. We had gone through a series of three rabbis vaccinations so I wasn’t worried about that. Our Iranian guide stopped at a pharmacy for internal and topical antibiotics. After talking with several other cyclists we switched methods for dealing with chasing dogs. We would stop and yell. At this all dogs, including the super aggressive ones, stopped and retreated thinking that “the game” was over. Accommodations – For most of Europe we stayed in hotels because I wanted a shower and bed at the end of the day. Retirement breeds comfort. But as we progressed through Asia this turned to camping as I became more comfortable with the tent. Jocelyn would have preferred camping all the way and was sometimes frustrated when I chose “another hotel”. Now that I look back I would have enjoyed camping more if we started that way. Along with that we enjoyed finding Warmshowers hosts online. This can be difficult if you do not feel like socializing with your host at the end of a long day. In most of Asia there are homestays that can be very good if you come pass them at the right time meaning late afternoon or early evening. Southeast Asia is full of these, also known as guesthomes, which are very inexpensive along with hotels. We paid $5-$10 a night for these accommodations. Some of the time these include food including dinner and or breakfast. Jocelyn was once again an excellent cycling companion. My slow riding and climbing did hold her back and I know that someday she will shine on the road by herself. She was my wingman and kept me out of trouble. Her excellent navigating skills made the trip easy for me as it seemed I was just along for the ride (and holding the purse!). We had the typical parent/child squabbles which sometimes were heated but we persevered and supported each other as a team. We stayed strong and together. We did it again! I would like to thank Andee once again for supporting our adventure. I have only been home for 5 months out of the last 39 since I “retired”. It is time to be a husband and father again. I would also like to thank Cary for taking care of the house and his mother. Thank you Andee and Cary! At the start of our next ride in Alaska they will drive our truck as we cycle south so this part of our next adventure will be a family affair. Dad once again we kept the wheels going round and round. Mom and Dad, thanks for watching over us. We intend to continue this journal in May. Haircut and trimmed beard. Ready to face reality.